*Work on this project was performed by Tom Rieger while with Street Lundgren & Foster Architects. Tom served as the Project Architect and LEED Project Team Manager in charge of all construction documentation, consultant coordination, contract administration, and communications with and between the owner and contractor. This was an ambitious project for Anchor Bank as they not only developed a new branch for themselves, but also an additional retail space available for lease. 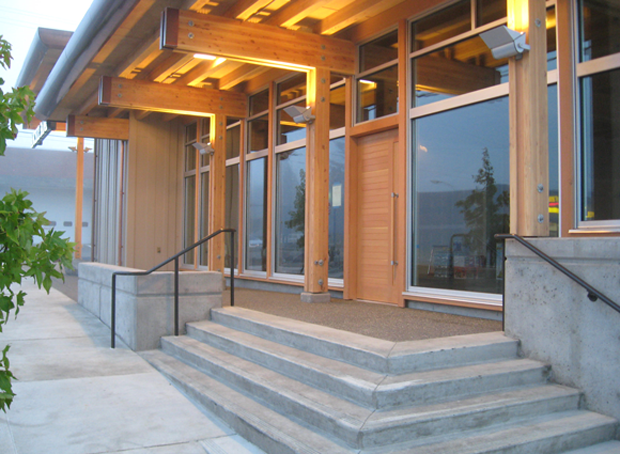 Two key features of this project are an abundant use of natural day lighting, and the use of douglas fir wood columns and beams as both the structural system and finish product. A seemingly simple and straightforward design, this project required meticulous attention to detail and careful coordination of interior consultants.